Every year, trolls knock down Kyri’s door and gobble up her Christmas feast. But this year, the trolls are in for a surprise: a boy and his pet polar bear on their way to Oslo have come in from the cold. And once the ice bear is finished with the trolls, you can bet they won’t come knocking next Christmas Eve! 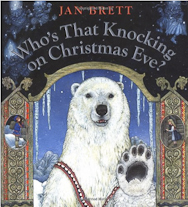 Once again, Jan Brett creates an original Christmas story full of warmth and magic. The children’s book (ages 4 to 8) features beautiful borders, intricate illustrations, and a stunning display of the Northern Lights.